The 56-DGT10 electronic digital theodolite from CST/berger is an attractively priced digital theodolite that provides surveyors and construction contractors with a full-featured and competitively priced solution for all of their advanced angle and alignment measurement applications. It offers advanced measurement capabilities and sophisticated features yet remains easy to operate so training time is minimal. The 56-DGT10 provides exceptionally accurate measurements thanks to a number of factors including its accuracy to 1/16 inches at 100 feet, 5-second angular accuracy and vertical tilt sensor. The 56-DGT10's vertical tilt sensor is specially engineered to effectively compensate for tilts in the vertical axis, resulting in highly accurate angle measurements. Measurement of long distances is a breeze with the 56-DGT10 thanks to its 1:100 stadia ratio and 450 ft working range. The 56-DGT10 also forgoes vernier scales that require complicated manual alignment in favor of an advanced incremental encoder detection system that facilitates simple and automated measurement of horizontal and vertical angles. Productivity is improved because operation is simple enough that no specialized training is necessary. If you're looking for a digital theodolite that offers an abundance of advanced features for a very affordable price the 56-DGT10 from CST/berger is an excellent choice. 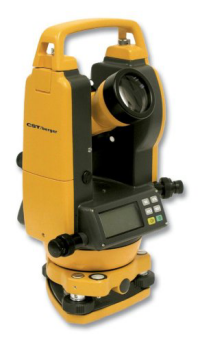 New and used CST/berger 56-DGT10 theodolites available on eBay. Removable tribrach for greater versatility in setups.